Our sel gris is stone-ground by hand until it reaches a fine consistency; it melts into other flavors seamlessly, imparting a briny mineral richness. 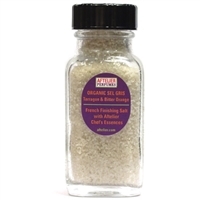 Sel gris French gray sea salt is hand-harvested from the clay-lined salt ponds in the Guérande region of France, giving it a soft grey color and mineral-rich moisture. These salts are not to be used during the cooking process, but rather to add a pop of flavor to everything from meat to salads to vegetables just before serving. These salts will lift the other flavors of a dish, making it special and delicious.